The Micronauts' great escape continues, as they stumble onto the last thing they expected to find on the alien world of Earth. Oz and Phen groggily awaken, greeted by Acroyear on the passenger seat of the scientist's speeding car, even as the sympathetic scientist barrels through the gates of the science compound. Whilst Larissa attempts to interface with the car's electronics, Biotron and Microtron are attempting to enact repairs on the Heliopolis, which is easier said than done with the ship crammed into the back seats. Things get even more unsteady when a trio of Humvees appears in pursuit, attempting to force Dell's car off the road. With the Heliopolis not yet flight-worthy, Acroyear resolves to deal with their pursuers, and bursts through the passenger window to engage them. The super-warrior barrels through the lead Humvee's windscreen and neatly slices off its steering wheel, sending it careening into a nearby tree. With two vehicles still in pursuit, Phen heads out to lend a hand, although the unexpected wind speeds see her briefly splat upon the lead car's windscreen. Quickly adjusting, she soon peppers the vehicle's tires with laserfire, puncturing them and leading to a pile-up of the two remaining Humvees. Back in Dr. Dell's car, the language barrier doesn't stop both Oz and the scientist from trying to give each other advice. With the Humvees down, a pair of attack helicopters is now incoming, and the Micronauts all pile aboard the Heliopolis to take the fight to them. The ship blasts off out the car's rear door, and despite the helicopters' massive size, well-placed shots from the Microspace ship's weapons send them down to the ground, as Dr. Dell safely makes her escape. In the clear, the Micronauts soon start debating their next move. Phen is quick to point out that they are stranded in this new world unless they can locate another spacebridge, although Microtron has surprising news on that front: the ship's scanners have detected an energy signature similar to that of the entropy cloud nearby! Realizing that it could represent a way back to Microspace, they set a course for the reading, although Larissa is not pleased with the idea of flying into the cloud a second time. The energy signature leads them over dense forest, and as they draw near, Microtron detects signals which seemingly indicate a city of Microspace origin. They descend into the woods to investigate, and Oz leads Phen, Larissa, and Acroyear out of the ship to explore. They soon find themselves in a Microspace-scale city, filled with ancient buildings and statues of insectoid beings... The kind of insectoid beings which suddenly surround them! With weapons trained on them, the Micronauts surrender, and Oz hesitantly asks to be taken their leader. He is met with a response from inside one of the buildings, a voice which describes itself not as leader, but a "shepherd." The speaker steps from the shadows, revealing itself as a Time Chamber, mounted on a set of mechanical legs! "Oh, sure, Why don't we just fly into the new entropy cloud we found? That worked out really well for us the last time." "This seems... peaceful enough. It makes me... very uneasy." "It's still early. Oz can get us in hot water before you can pull that big sword from... well, wherever it is you pull us from." Page 11, panel 3: "What?" Page 11, panel 4: "This is hard. So now what? Ugh." Page 11, panel 5: "I'm Oz. Listen." The city's inhabitants are based on the classic Micronauts Kronos action figure. Next issue will consistent refer to them as Kronus, with a 'U'. This issue is part of the Reconstruction post-event branding. 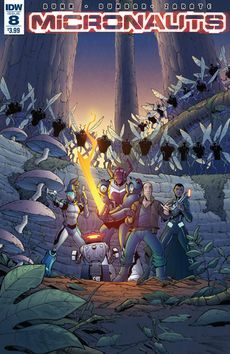 Regular cover: The Micronauts are surrounded by the Kronus, by Max Dunbar and Thomas Deer. Subscription cover A: Larissa, by Andrew Griffith and Joana Lafuente. Subscription cover B: The Micronauts and a looming Baron Karza, by Marcelo Ferreira and Thomas Deer. Subscription cover C: "Karza Centaur" action figure, by Adam Riches. Retailer incentive cover: The Micronauts on an Earth street, by J.K. Woodward. "The Hasbro Tribune" editorial page promoting December's Hasbro Universe Reconstruction titles, including G.I. Joe #1, M.A.S.K. #2, Lost Light #1, Optimus Prime #2, Till All Are One #6, Revolutionaries #1, this issue, and ROM #6. This page was last edited on 7 February 2019, at 22:07.